I have lived in Brisbane for more than 20 years and enjoy exploring every part of this beautiful city and its surroundings. This Saturday, there will be a special day for people of New Zealand descent living in Brisbane. On this day, they celebrate Taranaki Day to mark the anniversary of the foundation of this province in 1876. Taranaki is a province situated on the North Island of New Zealand. 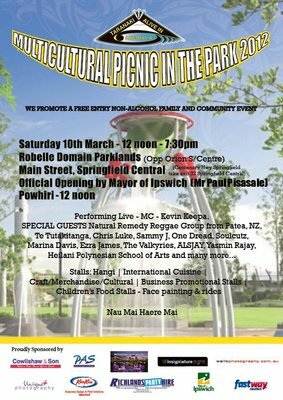 A multicultural picnic will be held at the Robelle Domain Park, in the heart of the Springfield Central Parklands, opposite the Orion Shopping Centre. The day will be officially opened by the Mayor of Ipswich, Paul Pisasale, at 12pm and will go on till 7.30pm. There will be plenty of fun and entertainment for the whole family. There will be stalls providing international cuisine and the famous hangi, to held satisfy everyone's appetite. Live entertainment will be provided by various performing artistes, among them, the ever popular Local and Live Soul Cutz, who also perform at the Parkland on Sundays. The Robelle Markets normally operates every Saturday from 7am to 1pm, but on this special day stalls will be showcasing crafts and merchandise with cultural themes, as well as business promotions. The children will not be forgotten as children's food stalls, face painting and rides will also be available. The Parklands have various other features and facilities including waterfalls, a cafe, water cascades, water play area and an activities and interactive playground, shady picnic areas, land art pyramids, art work, exhibition gardens and tree top walks. The day promises to be one well worth attending and the weather forecast is for a lovely sunny day. Hi is there an event for taranaki anniversary for 2014 in Brisbane?